If you perform relaxed and calm during practice, but find yourself performing tight or tentatively in competition, you can benefit from mental game coaching for figure skating. In fact many figure skaters struggle with performing up to their potential in competition. Do any of these statements sound familiar? I’m so frustrated with my scores in competition that I feel like giving up! I don’t feel like the same skater when I step on the ice for competition compared to practice. I wish I could perform with the same confidence at meets that I feel in practice. I feel like my performance is tight, cautious or that I try to not make mistakes in competition. If the above statements sound familiar to you, then you could benefit from mental training for figure skaters. 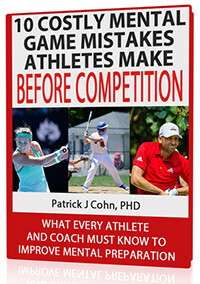 Dr. Patrick Cohn is a master mental training expert at Peak Performance Sports. Dr. Cohn works with athletes and teams worldwide from a variety of sport backgrounds including figure skaters and coaches. As the president and founder of Peak Performance Sports (Orlando, Florida), Dr. Patrick J. Cohn is dedicated to instilling confidence and composure, and teaching effective mental game skills to help figure skaters perform at maximum levels. In addition to working with figure skaters and teams, Dr. Cohn teaches parents, coaches, and athletic trainers how to help figure skaters achieve peak performance through mental game skills. Mental training for figure skating helps serious skaters like you to uncover the beliefs and attitudes that keep you from performing to your potential. Take your practice performance to competition consistently. Manage distractions during meets and perform with a laser-like focus. Don’t spend another moment under-performing in figure skating competitions or failing to perform at your peak. Call Dr. Cohn today and ask about our mental game coaching programs for figure skating. The Athlete’s Mental Aptitude Assessment (AMAP). Please contact us today to learn how mental coaching works and to request pricing on all mental training programs for figure skating. Complete the web form to contact us via email or call us toll-free.